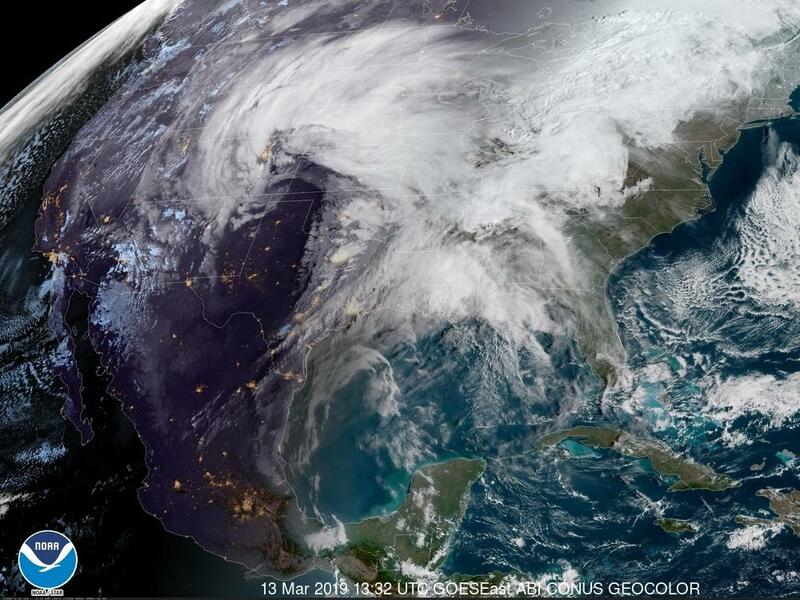 A 'Bomb Cyclone' Is Thwacking The Central U.S.
A satellite image from Wednesday morning shows a powerful storm system heading east across the U.S. The storm is expected to bring high winds, snow and rain to much of the central U.S. in the coming days. When a storm gets very intense very quickly, it gets a very special, very scary name: bomb cyclone. And just such a storm has arrived in the central U.S. The powerful system is already bringing high winds, rain and snow to an enormous chunk of the country, including the Rocky Mountains, the Plains, the Mississippi Valley and the Great Lakes region. The National Weather Service has issued high wind and winter storm advisories for an area ranging from Colorado and New Mexico over to Nebraska and parts of Texas, and up to South Dakota. "This will be one of the strongest wind events in years for West Texas and Southeast New Mexico," warned the National Weather Service office in Midland, Texas, with gusts up to 75 miles per hour on Wednesday. Winds that powerful can make it impossible to drive safely, especially in tall vehicles such as trucks. The storm could also cause flooding, as rain falls on accumulated snow and as rivers clogged with ice begin to rise. Unlike wind, flood risk can last days or even weeks as rivers crest. On Wednesday morning, some roads were already flooded in the northeastern part of Nebraska, and the National Weather Service issued a flood warning, saying more rain is expected later in the day. In the Denver area, blowing snow could cause dangerous blizzard conditions. On Twitter, the weather service warned residents to "cancel any travel plans Wednesday afternoon and evening." Colorado Public Radio reports that the storm could be the most intense storm ever recorded in the area, with the barometric pressure dropping a walloping 23 millibars in just one day. Barometric pressure is the pressure of the air in the atmosphere, and it changes when the weather changes. A drop in the barometric pressure generally accompanies "bad weather": wind, thunder, snow and rain. "That's where the word 'bomb' comes in, says Jeff Weber, a climatologist at the University Corporation for Atmospheric Research. 'We call storms that drop 24 millibars in 24 hours a bomb, a bombogenesis, the beginning of a cyclone.' The more technical (and less eye-catching) term is a baroclinic midlatitude cyclone." A bomb cyclone on the East Coast around this time last year killed multiple people, shut down train and plane service and knocked out power to about 2 million people. Scientists are still studying how bomb cyclones in recent years are, or aren't, affected by the larger trend of global climate change. The increasingly wide undulations of the jet stream — the wind highway that blows from west to east around the Northern Hemisphere — has allowed for more extreme temperature fluctuations in the continental U.S. And sea surface temperatures, which have been steadily rising, also affect the intensity of storms. But, says climate scientist Jonathan Martin of the University of Wisconsin-Madison, "There isn't a direct link between the slowly changing climate and this event." Although this storm is "rather unusually intense," he notes, "these things come around every few years."